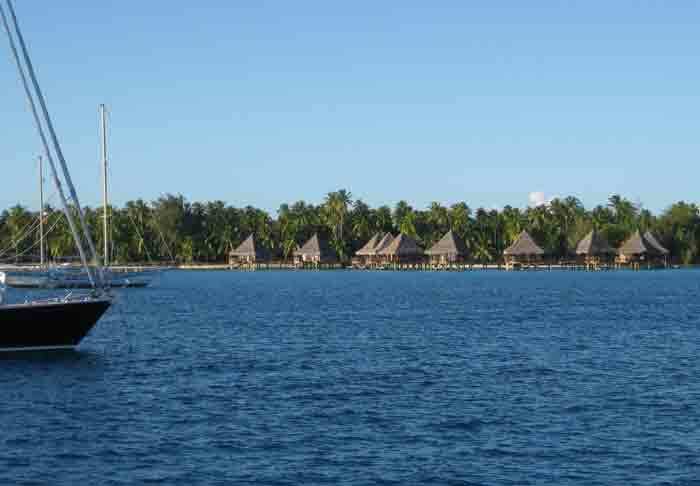 The most extensive area of French Polynesia is the Tuamotos. These atolls are known as the Dangerous Isles. With very good reason. They are the exact opposite of the Marquesas. No longer do we have the majestic craggy p[eaks of the Marquesas. Now we have no landforms higher than a palm tree! The Tuamotos are much older than the volcanic islands to the north. They are composed of tiny little islands (motos) which are all that remain after volcanoes have sunken down below sea level. These are the points left around underwater craters. They are covered in sand and palm trees in rings around gorgeous lagoons. 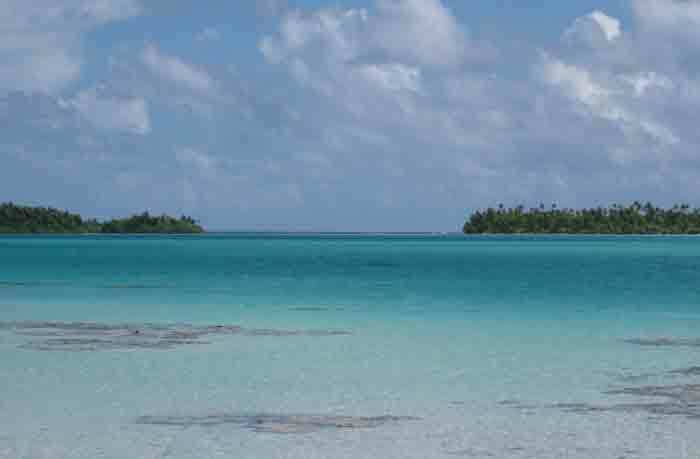 It is necessary to enter the lagoons through rather treacherous passes at slack tide and with good sunlight behind you in order to see coral heads. The water rushes out of the passes on the ebb tide at a speed of several knots. 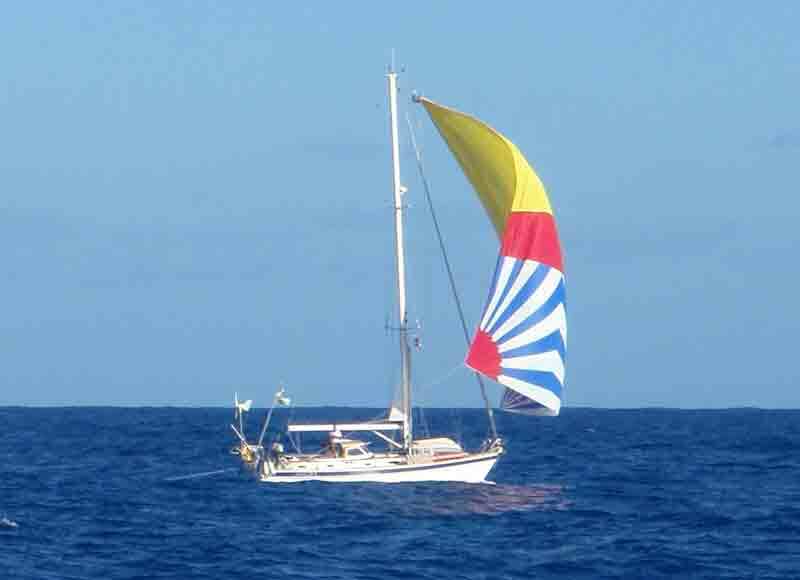 At one point, we were able to take photos of ISLAND KEA and they took our photo with the asymmetrical spinnaker flying! We could not see the islands at all until we were only a couple of miles away! BLUE MAGIC arrived at the pass first and said they had no trouble entering, although their speed was down to 4 knots (they are a big boat- our maximum speed is about 5 knots!). Next ISLAND KEA had more difficulties as they encountered a standing wave of 7 feet as well as the ebbing rip tides. When we entered the pass, followed very closely by ASPEN, we were suddenly down to 0.5 knots and falling. At an urgent request, Dave gunned the motor and we managed to make headway at about 1.5 knots! ASPEN almost stopped dead in battling the current! However, inside the lagoon we found paradise! Calm waters and gorgeous island scenery! Judge for yourself! Thank goodness Tom had an underwater camera to record it!!! 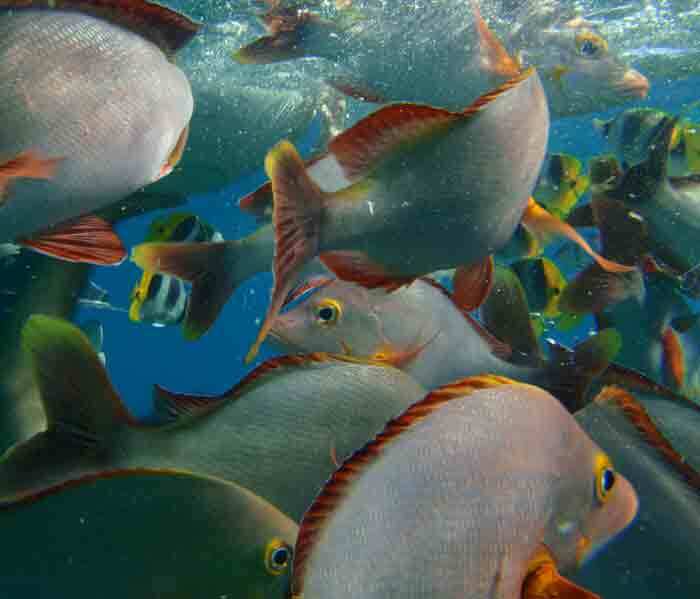 Dave and I also went diving with PARADIVE CLUB and it was quite spectacular with sharks, dozens of encircling barracudas, huge parrotfish and a large marine turtle. 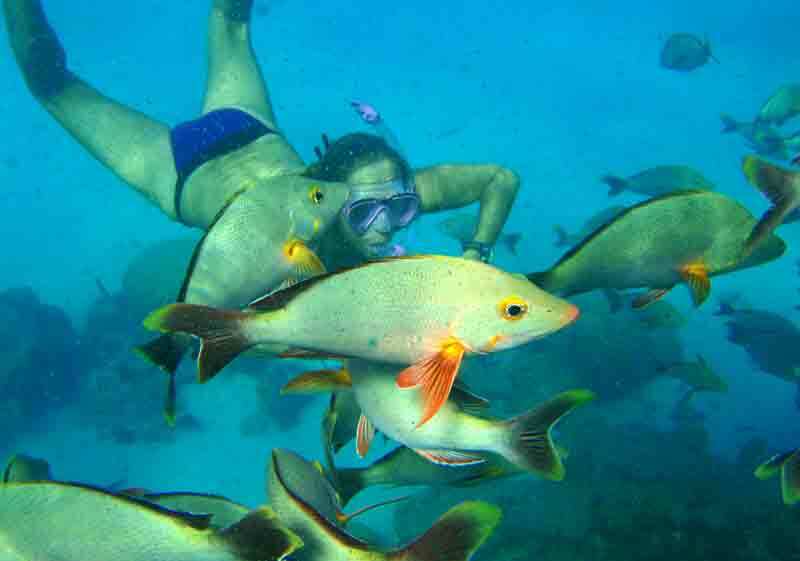 No wonder this was one of Jacques Cousteau's favourite spots! We decided to walk to the gendarmerie to check in and found that this particular motu is extremely large! Eventually we took a taxi partway. Afterwards we tried walking to the village at the other end (beyond the airport) and were delighted when a local teacher offered us a lift to the marina restaurant. After exploring the village, we decided a taxi might be a good idea! The next day we took the dinghy to the village to visit the ATM and that was MUCH better except for the spray on the return trip. Enjoy the photos of the rest of the trip- and dream of visiting some day! 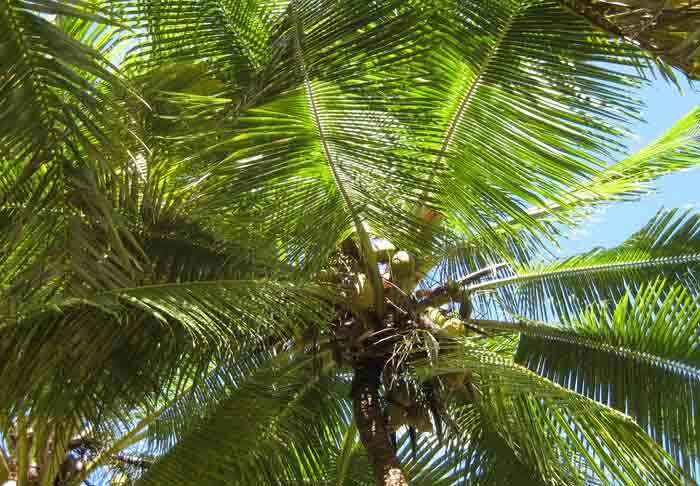 Nothing more strenuous to do than lie about looking up at the palm trees!